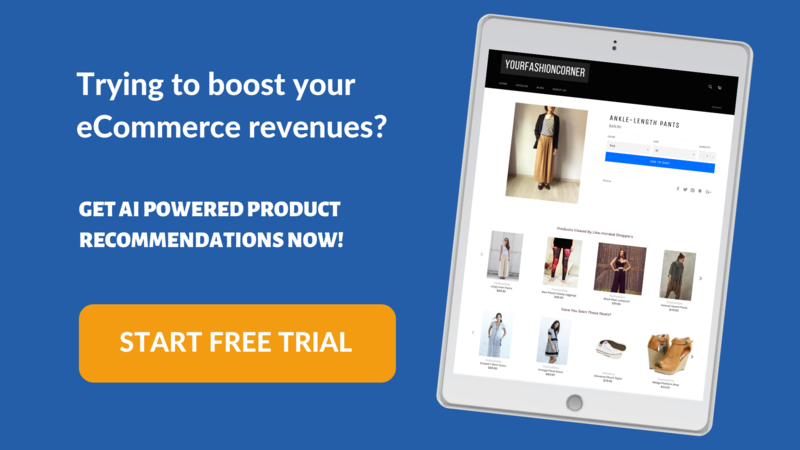 In this article I will be looking at why people abandon their online shopping carts, why it is important to optimize eCommerce checkout process and what are the best and worst practices online retailers are adopting in order to get this particular problem resolved. But first, we will look at the Shopping Cart and its importance. The moment your customers add something to their shopping carts, they are not browsing anymore – they are shopping! Now, when this happens, you’d want to believe that they would complete their purchase and checkout. However, the global cart abandonment in Q1 2017 alone was 75.6%. Shocked? Well, let me shock you some more. In the first quarter of 2018, online cart abandonment across industries was more than 75%. As a seller, your objective with the cart is two-fold. You want your customers to finish the checkout process and complete their shopping without abandoning their carts, and you would want your visitors to continue shopping and put more products into their carts, thereby increasing the average transaction value. 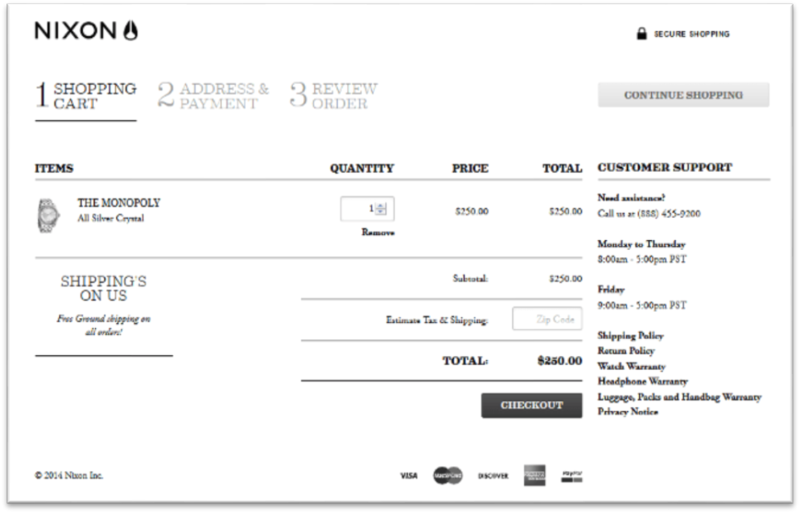 But one thing that is standing in between the cart and the final payment is the mighty ‘Checkout Process’. This is typically the stage in the buying cycle which includes billing, payment and any other shipping information etc. It is this stage, which if not optimized, results in abandoned carts. So, why do customers change their minds? Why do people abandon their carts? Without understanding the reasons of why customers abandon carts, it is impossible to reduce cart abandonment. I am giving the top 10 reasons here for a quick understanding. So, when we look at the above list of reasons, it is clear that all of these are primarily due to unclear information, complicated purchase process and lack of some really basic eCommerce best practices. The contents of your cart should be clear and simple. Small photos in the cart: This will not only help your customers to identify and confirm the products they have chosen but will also provide a nice presentation. A small description of the product: Along with the name of the product, you should include a short description giving additional information for the visitor to confirm that what they’ve chosen is appearing on the cart. Costs and Quantities: The costs and quantities of each item must be shown distinctly. The information should be legible and should be accompanied by sub-totals and the total. Editable Card Content: Make sure that the quantities ordered can be edited, without leaving the page. You can either incorporate a drop-down in the quantity box or include ‘+’ and ‘-’ buttons. Update Cart Functionality: Once changes have been made to the contents of the cart, there should be an “Update Cart” or “Update Quantities” button. This finalizes/confirms the changes made to the cart. Customer Support: This is an optional element, but definitely goes a long way to imbibe trust in your customers for your brand. Merely having all the right content in your cart page is not sufficient. 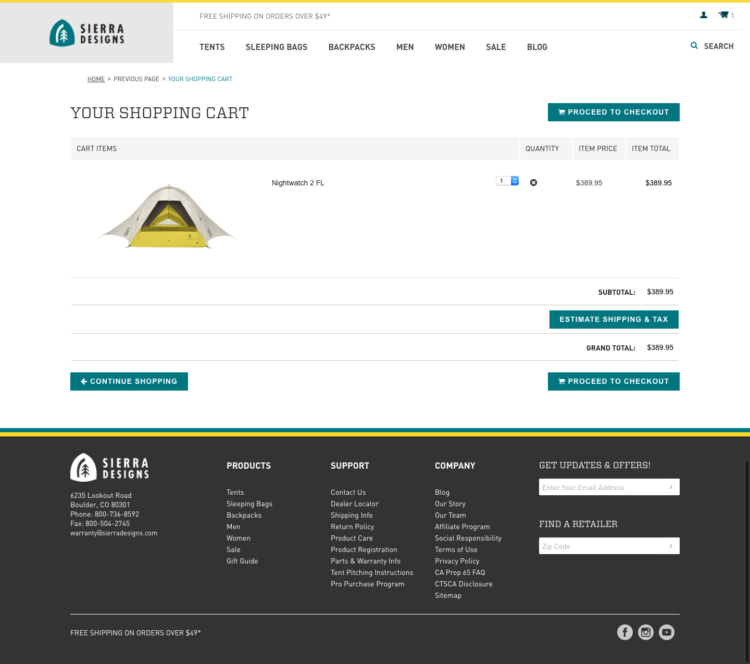 Having a clean and understandable layout is what brings out the best in your eCommerce cart page. To get your customers to complete the purchase process. There are typically two layouts for a cart page. 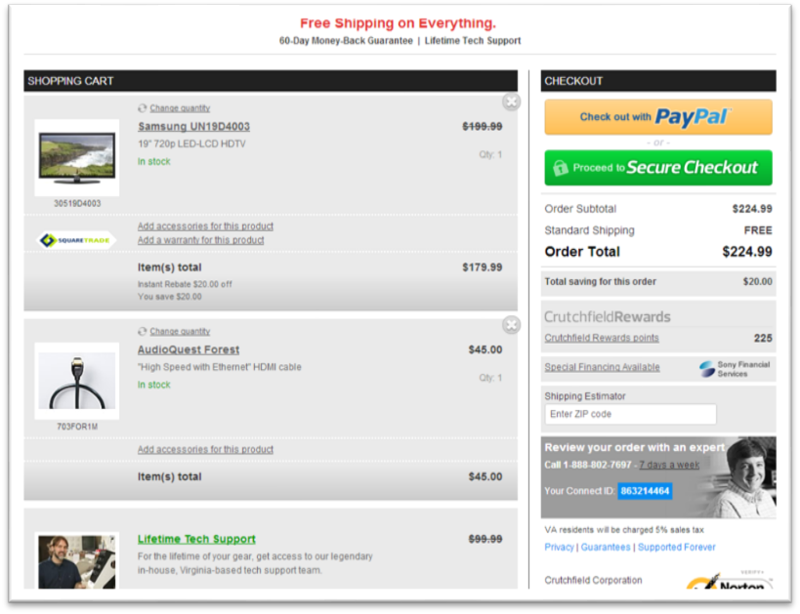 The one-column layout gives a list of all the products added to the cart, their prices, and at the bottom lists the total with a button to complete the checkout process. 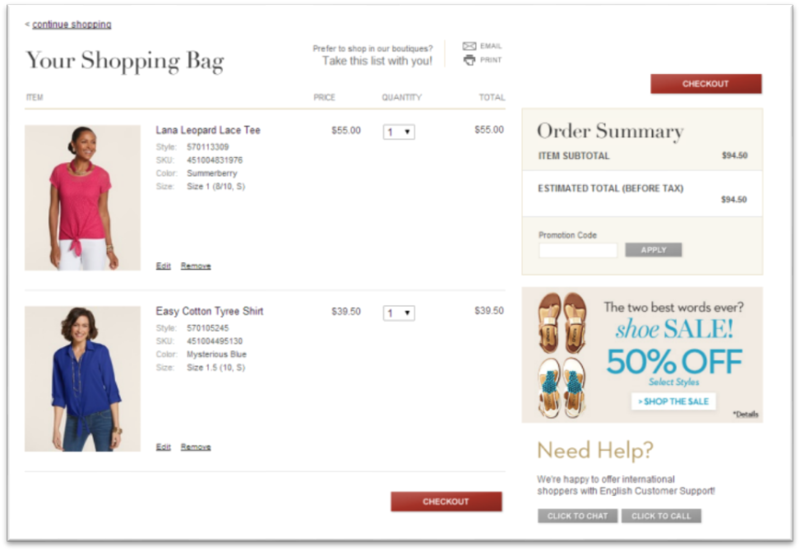 Mobile optimized eCommerce stores usually feature one-column cart layouts when viewed on a smartphone. The two-column layout displays the products in a list in the first column and the second column contains the total and the button to complete the checkout process. Links like “View Accessories” or “Continue Shopping” increase transaction value by promoting upselling and cross-selling. These are usually found next to the “Complete Checkout” button in case of “Continue Shopping” and below or next to the particular product in the case of “View Accessories”. There are many third-party apps like Perzonalization which when integrated with your eCommerce store, will help you upsell and cross-sell products by recommending related products to your customers. Links for customer support, warranty information or ‘Site Secure’ information accompanied by a list of payment options help to build trust. Additionally, give your shoppers the opportunity to save their cart for later, or bookmark specific products as favourites. In order to optimize the shopping cart page, we need to first target the single biggest elephant in the room – high shipping costs and other costs that could be involved. 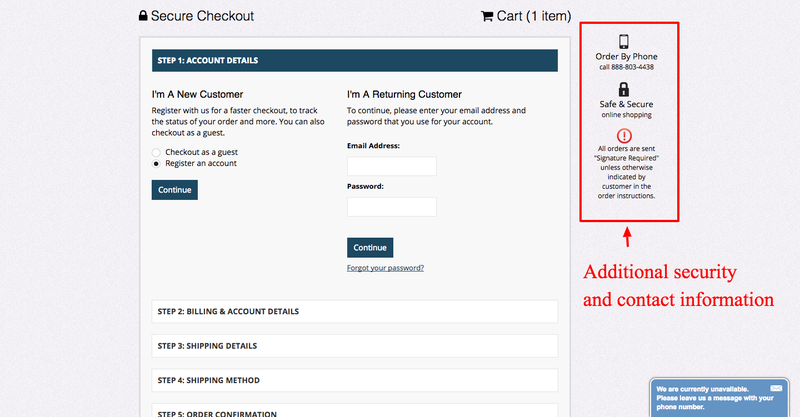 So, let’s first deal with this and then look at the other elements of the Cart which can be optimized. High shipping costs is the main reason behind the recent trend in increasing cart abandonment issues. This is also the reason why many major eCommerce players have now started playing around with this single aspect of cart optimization. From including free shipping as a part of a minimum order value to simply offering all-time free shipping and free returns, online retailers are trying to make this stage as smooth as possible. However, one thing to keep in mind here is that it’s not merely enough to offer free shipping; it’s important that your customers are told about it at the very onset of their purchase journey, so that they can shop stress-free. 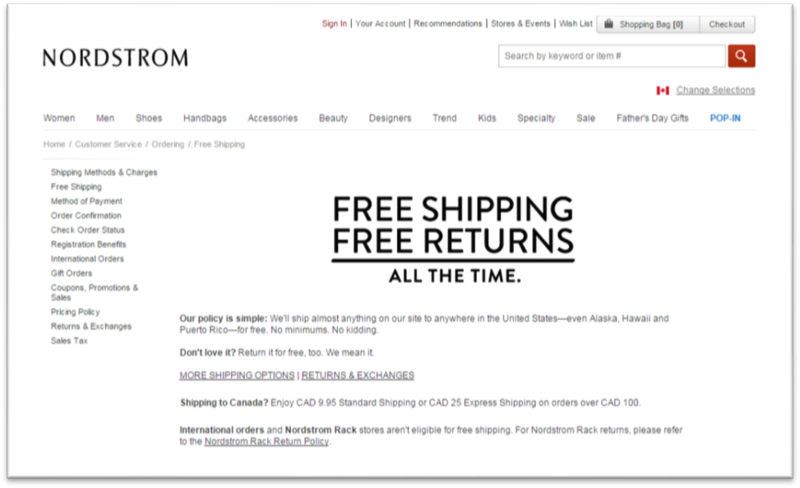 Look at how Nordstrom informs its customers about free shipping at the very moment they start interacting with its customers. 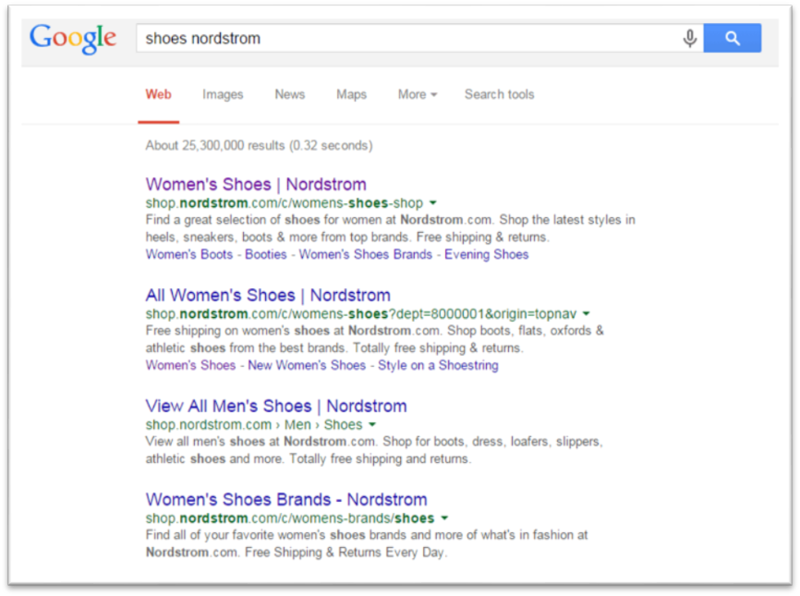 Not only this, Nordstrom’s Meta texts feature its ‘free shipping, making this information readily available on all organic search results. 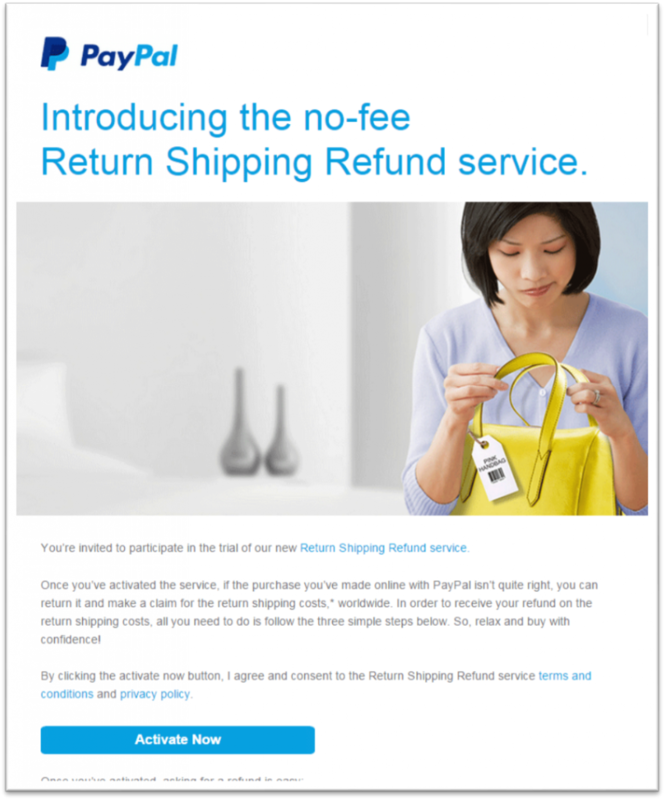 If you are wondering how smaller eCommerce stores – like Shopify stores – are going to afford free shipping all the time, PayPal recently announced a Return Shipping Refund Service, which basically allows you to offer free shipping and returns for payments made through PayPal. Always give your visitors a chance to browse through your store without them having to create an account. There is a reason why this accounts for 37% of your cart abandonment issues. When Amazon doesn’t mind doing this, I see no reason why you shouldn’t. The guest checkout option is an example of reducing the chance of your customers’ “hitting the wall” in checkout process. When you give your customers the option to check out as a guest, you tell them that they can make a purchase without giving you their personal information. This helps reduce abandoned carts. 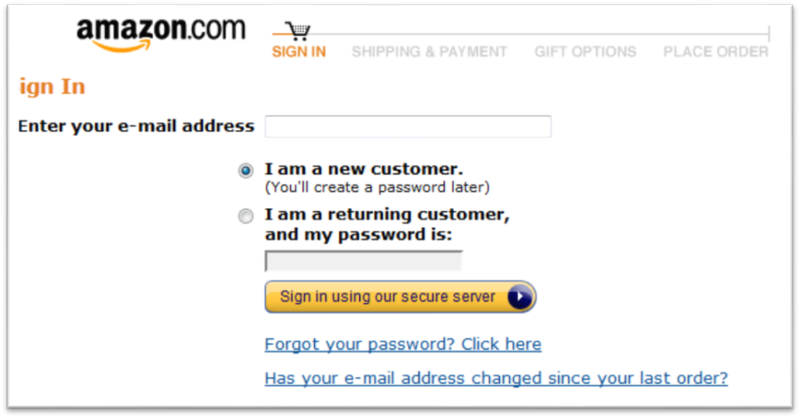 But if you have to get customers to log in, you can do two things to ease the process for them. First, you could enable them to use their social media login to get in to your site. This takes away the effort of entering every single information manually and makes it possible to complete the registration with a single click. Second, you could reward customer registrations. Offer them a discount or price reduction on certain products or give them free shipping, if they register. This will make your customers feel that they will actually get an award if they fill out the form. If, for some reason, you need to have a couple of pages to be filled, give a visual indicator to your shopper on how far they have progressed in the process. 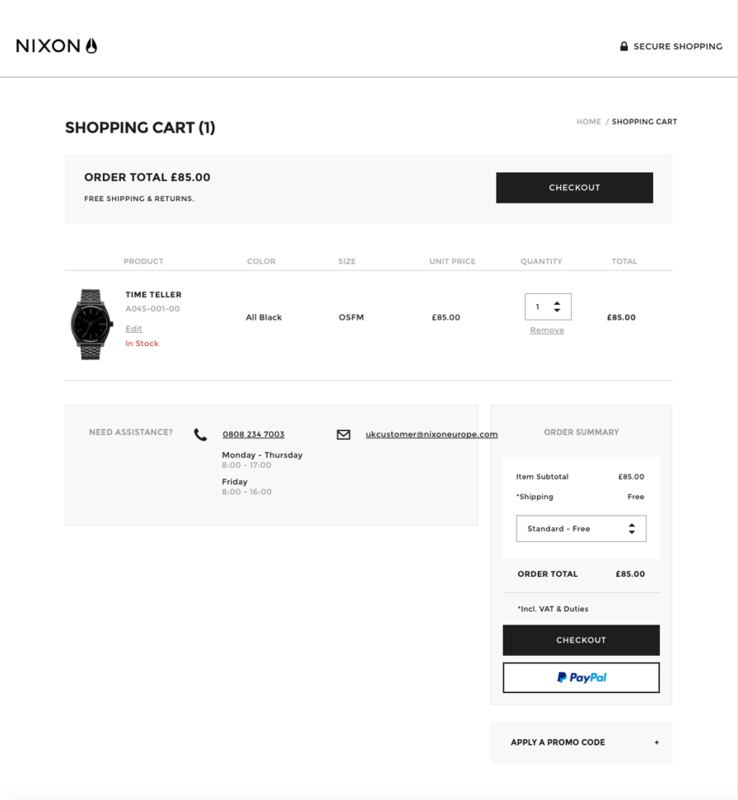 Nixon’s cart page below will give you an idea on how this can be done. Add ‘checkout’ buttons at the top and bottom of the screen, so that no matter where the customer is, he is never far from one of those. 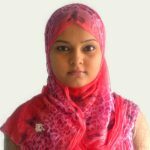 Allow the customer to copy the shipping address to the billing address and vice versa. This will save them time and effort. Make your customers feel that security of their personal information is something you take very seriously. Get an SSL Certificate and proudly showcase it on your payment page for your customers to see it. The ‘https’ in your web address also means that your site is a secure site, and nowadays many people know these basics. So, host your eCommerce site on a secure site. Once a visitor creates an account on your site and fills up information like shipping method, billing and shipping addresses, credit card information etc., make sure that your site stores that information. This way, your customer doesn’t have to re-enter all the information every time she stops by. When people don’t have to waste their time on these things, buying becomes a one-click process. Over and above the standard credit cards like Visa, MasterCard and American Express, offer other payment options like Debit Cards, Cash on Delivery etc. Although there is no hard and fast rule on how many payment options we want to give our customers, some simply prefer one payment method to another. Consider allowing payment options such as Google Wallet, PayPal, Dwolla or similar other modes of payment available. Consider third-party integrations such as Amazon Pay. Sometimes, your payment options should also depend on the country you operate in. Sometimes your customers may encounter errors despite your best efforts. If that happens, make sure that your errors are not generic. Ideally the error should spell out what the particular error is and how to resolve it. This will reduce customer frustration and will keep them moving forward instead of quitting. When a customer has brought a product, he would want to know how soon the product is going to be delivered or whether he is entitled to a free shipping etc. Look at the checkout page from ASOS. It shows three key messages for all its paying customers. These kinds of messages remind the customers that you care about them and their safety. It will immediately make them trust your brand and they will want to come back for more. Amazon always uses this, and I like it because it makes me feel that Amazon is going a step further to save me from the effort of gift wrapping. It becomes particularly valuable around the holiday shopping seasons. These “little things” which add a personal touch and hels the shopper save time are very valued and remembered by customers. Consider some creative and trending financing options for those high-value items. Use Paypal’s “Bill me Later” function or offer payments in installments (EMI). This will have a two-fold benefit. It will move your high-ticket products faster and also encourage customers to buy that product instead of leaving it in the cart. This is important, considering almost a third of eCommerce transactions come from mobiles and tablets. Make mobile optimization a priority for better sales and improved conversions. You will definitely see a reduction in your cart abandonment. No one wants to off-site to a coupon directory to find a promo code. Keep your promo codes in your check out page where your customers can see it. Everyone loves a good deal. Showcase products which go through a price reduction. Show the previous price of a product. This will encourage your customers to grab the product while it is still on sale. Remember, that your customers are already giving up too much when they enter sensitive information like their credit card details. If you need specific information like their date of birth, which ideally doesn’t have any direct connection to their purchase, give them reasons for asking for such information. May be you are offering special discounts on birthdays. Tell them that. It is normal human psyche to stick to a brand which is always there to listen. Make sure you incorporate that in your store. Provide customer service to your shoppers at all times, and show them that you care. Add a 365-day return policy for that icing on the cake. You will always have some cart abandonment even after you have done your best. For those times, take the help of email marketing. Send cart abandonment mails to your customers and create a sense of urgency in your emails. Make sure that the email is personal and personalized, and not some bulk email that you have sent to all your customers. 5. 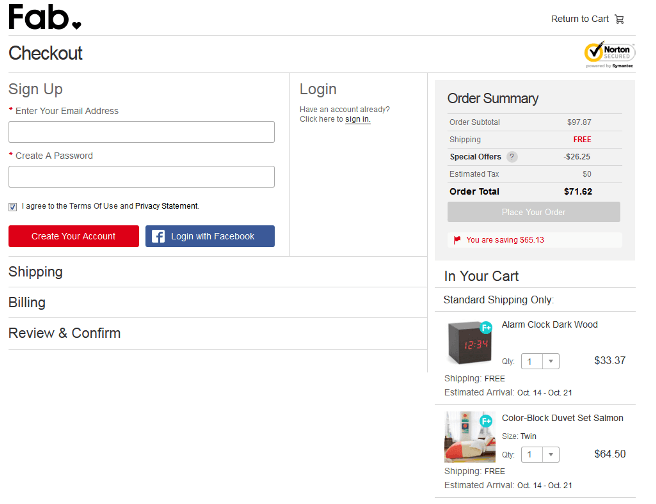 Have a Checkout progress Indicator Clutter your checkout page. 6. Highlight the important steps with CTA Hide the most important information. 7. Inform about Products’ availability Make your background colour for the checkout page jazzy. Make sure the background colours serve true purpose. 8. Allow multiple payment options Ignore your font size and don’t make your customers squint. Reserve bigger font size for important information and smaller size for terms and conditions. 9. Save all customer information, even for guest login Overuse whitespace and confusing line breaks. 10. Use cart abandonment mails Put any information on the Checkout Page which can distract your customers – like header and footer navigation, related products, banners etc. Berkey Water here is a really good example of displaying security information on the checkout page. There is no way a customer will miss that when he is entering his credit card details here. This is another neat checkout page I really like. This page spells simplicity. It removes all distractions, and it pulls the cart summary information down as you progress. This is a very strong cart page and a lot of research must have gone into this one. I like the way it provides a summary of the order, followed by a clear ‘Next Step’, and all the way to the next stage of the checkout. 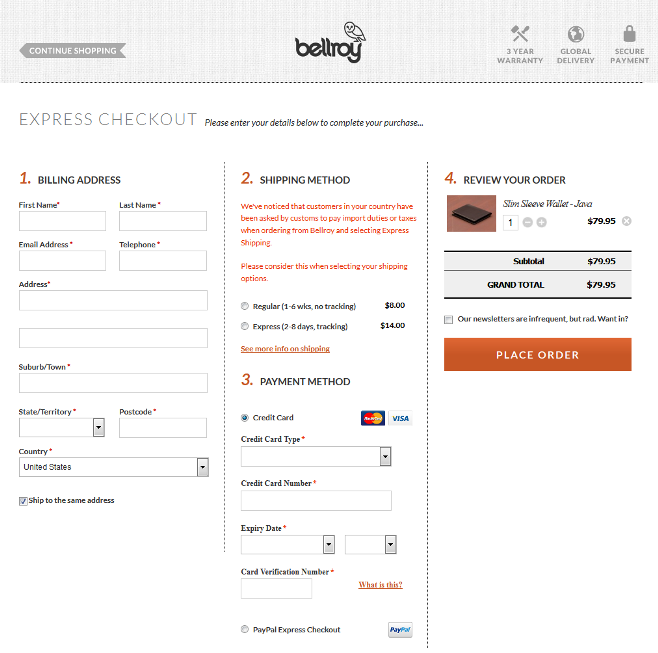 Now, Bellroy has managed their cart abandonment issues really well. 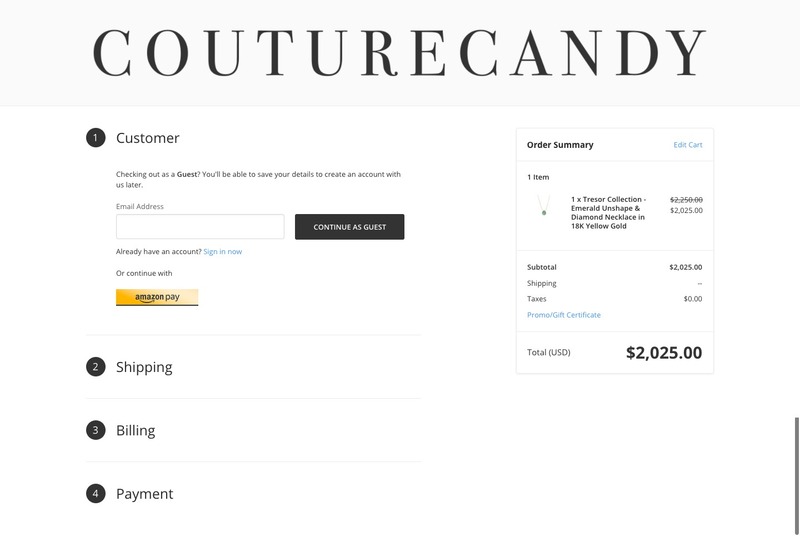 It’s a one-page checkout, which is always a better option, and it also gives its customers a disclaimer about shipping costs, which keeps customers informed what they are paying for. Speaking of Social Logins, Fab does a neat job of providing an option to login with Facebook to complete the purchase – thereby saving valuable customer time. Additionally, they also clearly display the shipping cost for each item separately. 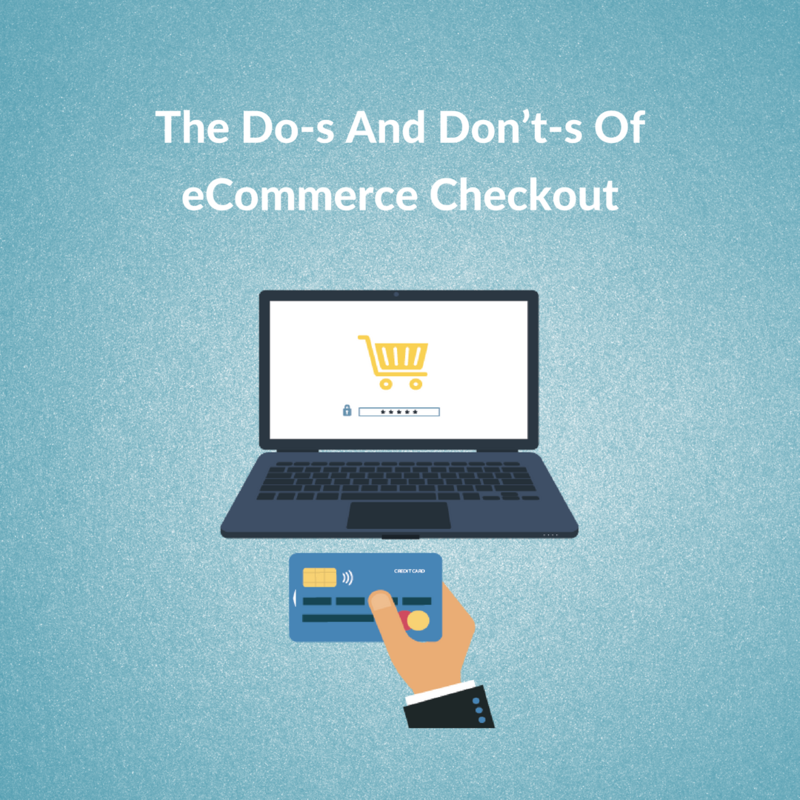 Ultimately, the checkout process should be as convenient as possible for the user, and it is safe to say that there’s no such thing as an optimum checkout process. The results will always vary depending on the product you are selling, demographics, price point and various other factors. The best results are likely to come only from continuous testing, monitoring and improvising. For starters, in order to prevent cart abandonment, you need to ensure that the page is well designed and avoid confusing your shoppers – simplicity and user convenience are really the winners here! The actionable tips/hacks I have mentioned in this article will help you to improve your checkout process and improve your conversions. So, let me know how it went!